At this Indiana attraction, you will find plenty to explore and keep you busy and entertained! 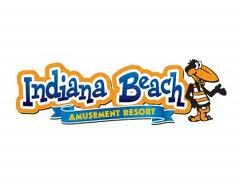 Located in Monticello, Indiana is the Indiana Beach Amusement Resort! Combining regular rides with water rides, this park is sure to make everyone in your party a happy camper! Start off with the SkyCoaster which will definitely catch your eye as your peer up in to its enormous heights - at 110 feet high, you can truly experience a sky-dive and a hang-glide after you pull the trigger and pull your ripcord! Yikes! A favorite too is the highly rated Dr. Frankenstein's Haunted Castle where you will be chased and haunted by ghosts, ghouls, goblins and more! A unique ride to not miss is the Splash Battle where a group of you will embark in to a battle in water tanks with the goal of firing water cannons at each other! Looking for a classic wooden coaster to take you back to the old days? Look no further with the Cornball Express that was rated #1 in 2008. Say g-force? Yup! If you're looking for some adventure time in the waterpark area, be sure to check out six impressive water slides, an action river where you float through on an inner tube, a swimming area with sandy beach, a Splash Bash and Big Flush, a unique water coaster! Don't leave without headed to Adventure Point! This zipline ride is a sure fire way to put away your fear of heights and get the thrill of a full zipline! Strap in and fly away as you zip through the many lines this park has to offer. Unlimited admission for all of 2019! Access to BOTH the amusement park and water park! Free parking! ONE Bring-a-Friend-Free ticket! - Must purchase and process by 6/24/18 to receive this benefit! Valid any operating day Opening Day 2019– June 24, 2019. ONE Bring-a-Friend discount ticket! Valid weekdays in July and August 2019 and is $14.99. Free admission to Declaration Celebration! Free admission to Oktoberfest! Free admission to Halloween Horror! Monthly food and retail offers throughout the season! Access to all Apex amusement parks, water parks and family entertainment centers! 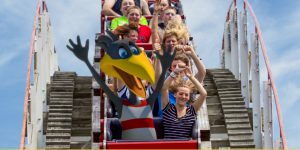 To view Indiana Beach Admission Tickets, other Specials and Coupons, go to their special page by clicking here. Indiana Beach updates this page throughout the year, so check back to see if new specials and coupons have come in. Note to our visitors: Indiana Beach coupons and specials can change without notice. So please visit their official website to make sure of the latest pricing and coupons.